The Final Four consists of the number 1, 3, 4, and 15th-ranked teams by Pomeroy measures. It's not hard to find the ugly duckling, in that context. But even before the ball was tipped in Michigan State's first round matchup against Georgia, this was a curious team. I'm on record that I was dead wrong about the Spartans' prospects coming into the season. I don't think my outlook was borne in I Hate Tom Izzoville, either. MSU lost its three best players from last year (Gary Harris, Adreian Payne, and Keith Appling), and replaced them with a trio of non-impactful freshmen and a transfer who hit 30 three-pointers in conference play, but didn't do much else (considering Harris, Payne, and Appling combined for 72 three-pointers in Big Ten play last year, that's a deficit). Gavin Schilling and Alvin Ellis were the only two returning sophomores, and while Schilling definitely improved, we're still talking about a severely foul-prone center that has a scouting report that simply reads "Rebounds. Can Dunk." As for Ellis, he was better as a freshman. Obviously, that's quite the miss on both Trice and Valentine. Trice was probably the best point guard in the Big Ten not named "D'Angelo" (sorry, Yogi), and Valentine was good enough to merit comparisons (at least, offensively) to Draymond Green. Trice's leap was especially miraculous, as he increased his usage by 79% while keeping most of his efficiency (a tall task, given that last year he was well suited to the corner marksman role now occupied by Bryn Forbes). Seniors—especially those not regarded as one of the nation's top-100 players in their high school class—generally do not undergo this kind of transformation. It's probably not going to happen for Bryn Forbes, or Anthony Clemmons, or Joey King, or Benny Parker. Travis Trice is a unicorn that rides the Loch Ness Monster to work after feeding his pet Bigfoot. You will not witness such a thing often. 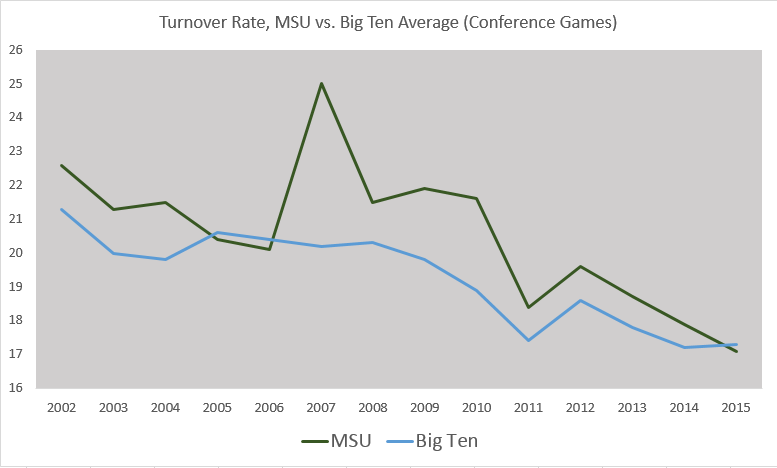 For years, it's been a struggle for Tom Izzo's teams to keep its turnovers in check. I'm sure that's as much a function of the style of offense the Spartans usually choose to employ (one that traditionally has included a lot of offensive rebounding and fewer 3s) as anything else, though even when the team plays out of character (for instance, by shooting a lot of 3s last year, or in 2004 when the team's offensive rebounding was relatively poor) it's still a struggle. I suspect the fact that Michigan State runs so many set plays also plays a role, but that's mere conjecture on my part. In any event, even this season the Spartans just barely were better than average in the Big Ten. This is not unprecedented, nor is it a sign that turnover problems are gone. Keep in mind that "barely better than average" are not words usually associated with Michigan State basketball, and certainly not going to strike fear in the heart of a Final Four opponent. But in their Tournament run, the Spartans have posted a turnover rate of just 13 percent over 245 possessions. Now sure, Louisville's defense isn't up to Pitino standards this season, and Virginia and Georgia generally don't try to force turnovers, but keep in mind the story the graph above shows. Michigan State wasn't playing VCU for 14 seasons, they were playing Average Big Ten Opponent, who usually is not one for a pressing style of basketball. And yet, too many MSU possessions did not end with a shot attempt. Is this newfound respect for possessions a mere statistically anomaly? Newly-discovered offensive wrinkle? Something as simple as fewer minutes for the turnover-prone Lourawls Nairn? We'll find out Saturday.